Description: Male is sky blue above; paler below; whitish belly and undertail coverts. Female is brownish-gray overall, with white belly and undertail coverts, and a trace of blue on wings, rump, and tail. Juveniles are brown above; lightly spotted below; and a pale blue wash on wings and tail. 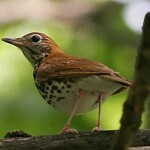 Habitat: Breeding birds occur in open woodlands, especially open pine stands, burned or cutover areas, and aspen clumps. Migrants seen in flocks in open country, perching on roadside fences or telephone wires. 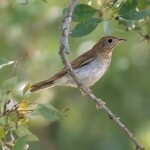 Where in Nebraska: Common spring and fall migrant in west. Sometimes observed east to Douglas County. Common summer resident in Panhandle, especially the Pine Ridge and Wildcat Hills areas. 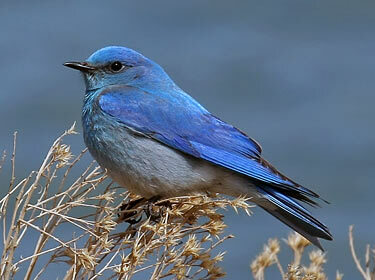 Field Notes: More often seen hovering above prey, chiefly insects, before dropping to catch them than other bluebirds. 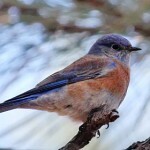 Fun Facts: Mountain Bluebirds are gregarious at times, with flocks of over 100 seen.